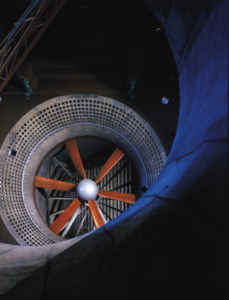 I start with this image of a turbine from one of the wind tunnels at Farnborough, a site with great significance for British aviation history. Here both the Concorde and Spitfire were tested. Nearby balloon and zeppelin technology was pioneered. Derelict, or at least closed, for 40 years, the Farnborough site has been given a new life and now hosts Air Shows and art projects. It is also the centre of thriving community life. Julian Harrap Architects, restoration specialists, played an integral role in the rejuvenation of what was an urban ruin. Harrap came to speak with us at Birkbeck on 19 March. He shared his thoughts on the materiality of ruins. Perhaps surprising, given some of his recent work on Berlin’s Neues Museum and Sir John Soane’s Museum, Harrap focused his talk on the Farnborough Business Park project. In so doing, he immediately dispelled several prevalent conceptions of ruins. The first is that of ruins as expressive of either Romantic or Gothic sensibilities. We need only look so far as the 2014 ‘Ruin Lust’ exhibition at London’s Tate Britain to encounter this conventional narrative. The second is that of ruins, especially contemporary ruins, as products of catastrophes (both natural and human-made). Neither of these preconceived narrative tropes may be applied to Farnborough’s story. The Farnborough site is 20th century in origin and its fall into dereliction was not strictly speaking cataclysmic. It is perhaps better characterized as yet another victim of contemporary socio-economic culture where it is so often easier to discard and dispose rather than to recycle or repair. The work at Farnborough show us that the remains of the 20th century can be beautiful, as is evidenced by the re-constructed Portable Airship Hangar (see photo above left), whose elegant metal arches were recovered from other structures on the site, and the cooling towers (see photo above right). It also conveys to us that the work of our hands and those of the not so distant past ought to be valued for both practical and aesthetic reasons. However, neither of these points are new. In fact, the Portable Airship Hangar and several of the buildings on the Farnborough site have been listed structures since 2009. Where Harrap’s talk and his practice offer new insight into ruins, and what saves his work from any accusations of fetishizing the old and preoccupation with the intervention, is his emphasis on use, appropriation, and transformation. The principles at the heart of Harrap’s architectural practice are intensely ethical and offer an inspiringly thoughtful model of what it could mean to live historically, or rather what it could mean to live with the notion that one is part of a continuum of human life and creation. For Harrap, to be a restoration architect is to engage in thoughtful stewardship of cultural heritage, and to sign a covenant with past and future generations in stone. Sometimes restoration involves a careful intervention in order to establish a new equilibrium. Sometimes it means stabilising a situation so that those in the future with different technologies and other needs can determine the future of the place. In some cases it forecloses possibilities and in others it leaves them open. But in every case, the work is part of an on-going conversation between what came before and what might come later. And this is why Harrap’s practice is so extraordinary. So often a particular architecture is recognizable by a signature. For me, Harrap’s work is recognizable by its fingerprint.